Competing companies often call each other out for exaggerations in ads and other marketing sleight of hand, but Cablevision has decided to let the legal system settle its dispute with Verizon over claims of who has the “fastest WiFi available.” Meanwhile, Verizon says the lawsuit is a marketing ploy to sell Cablevision’s WiFi phone service. The suit [PDF], filed today in a U.S. District Court in New York, accuses Verizon of making misleading statements that not are not only false advertising about its own products but which also mislead consumers with regard to Cablevision. “Verizon’s false claim of WiFi speed superiority is deliberately designed to undercut Cablevision’s competitive WiFi advantage in the marketplace,” reads the complaint, which adds that the Verizon claims are “likely to interfere” with Cablevision’s recently announced WiFi-only voice, text, and data service. “The false ads in Verizon’s campaign are designed to undermine the competitive threat Cablevision’s WiFi services pose to multiple facets — both internet and cellular service — of Verizon’s business,” continues the suit. Cablevision contends that Verizon is basing its speediest WiFi boast on the new AC1750, 802.11ac routers that its customers are gaining access to. The problem is, according to the complaint, that Cablevision already offers AC1750, 802.11ac routers to its customers, and has for about a year. Since both companies are offering effectively the same WiFi routers to customers in the same general area, Cablevision doesn’t see how Verizon could claims its service is the fastest, especially when customers have to pay up to $199.99 (or $9.99/month) for Verizon’s while Cablevision’s is included with service. The suit also points out that Cablevision has rolled out more than 1 million WiFi hotspots for customer use in the New York City tri-state area (NY, NJ, CT), meaning subscribers have wider access to WiFi out of home, as Verizon’s hotspots in the area are actually licensed through third parties. 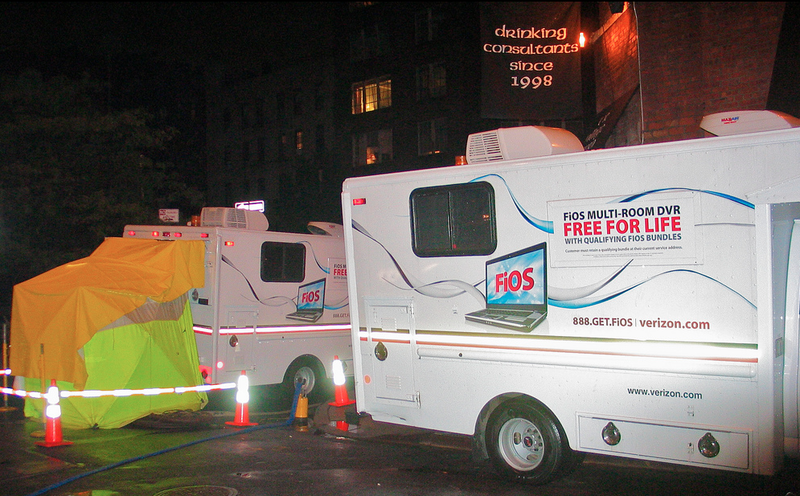 It’s worth noting that Cablevision has introduced a large number of its hotspots in a similar and controversial fashion to Comcast, by using using each company-supplied wireless router for both the at-home subscriber and WiFi users on the go. Companies that do this claim that users of the public WiFi will not be able to access the home network and that the public use does not affect service to the paying subscriber, though many people are skeptical about both of these claims. Back to the complaint… It takes particular issue with the fine print in Verizon ads that support the “fastest WiFi” claim by citing a study that Cablevision believes was privately commissioned and is not available to public. Cablevision says it sent a letter to Verizon on Jan. 23 demanding the withdraw of the ads in question and explaining that the routers being offered by both companies are identical. The company also requested a copy of the study Verizon cites in its ads. According to the complaint, when legal reps for both companies spoke, Verizon again pointed to this study but as of today had not made it available. “Verizon’s false advertising campaign is especially damaging to Cablevision because Cablevision’s superior WiFi capabilities have long been a market differentiator for Cablevision,” reads the suit, which alleges violations of federal false advertising prohibitions and New York state laws regarding deceptive business practices. What may be confusing to many consumers is the discussion of “fastest WiFi” at all, as many casual viewers might assume this means fastest broadband access when in fact one has little to do with the other. You can have the fastest in-home WiFi on Earth but if your Internet connection is slow as mud — or if your ISP is deliberately allowing your Netflix stream to bottleneck — that world’s fastest router can’t speed up data it’s not receiving.